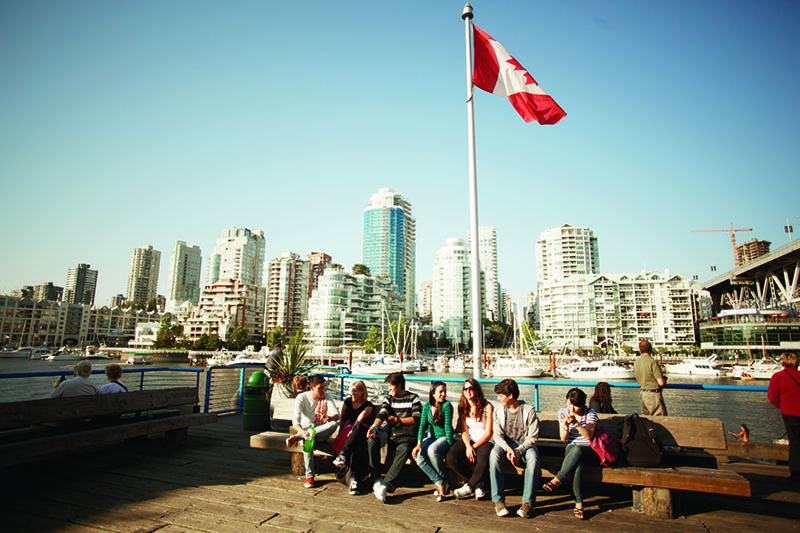 Learn English in Vancouver at our partner school EC Vancouver (formerly known as LSC). EC has been offering high quality tuition since 1962, with programmes designed to offer students a choice and variety in studies and a combination of courses can be selected by students to customise their learning. All of the teachers are university graduates with training in second-language instruction, using both proven traditional techniques and the latest teaching innovations. Airport transfer on arrival at Vancouver International Airport. Visa document courier fee: € 56. In 2019 the school is closed on: 01/01/2019, 18/02/2019, 19/04/2019, 20/05/2019, 01/07/2019, 05/08/2019, 02/09/2019, 14/10/2019, 11/11/2019, 25/12/2019, 26/12/2019. Missed lessons due to bank holidays will not be refunded or rescheduled. Minimum age is 16 all year round. For under 19’s, a parent authorisation form must be submitted; single room homestay and airport transfers must be booked. No supervision is provided. Students should also provide a Custodianship Letter if requested by the Canadian Embassy. This may be arranged for a fee of approx. € 104. The academic year course is a study programme of 28, 32 or 36 weeks. The academic year course consists of 20 or 24 lessons per week in groups with a maximum of 15 students. A TOEIC test (Test of English for International Communication) is included. The Cambridge exam course prepares you for the Cambridge exam FCE, CAE or CPE and has a duration of 4, 8, 10 or 12 weeks. The course consists of 20 or 30 lessons per week in classes with a maximum of 15 students. The course with a duration of 4 weeks is only available with 30 lessons per week. A good knowledge of English is required to participate in the Cambridge exam course. It is possible to start with an intensive course, followed by the Cambridge exam course. The Cambridge courses might need either an extra night or week of accommodation due the exam date. The extra accommodation is not included. Price on request. TOEFL, the Test of English as a Foreign Language, is an academic qualification. A high score is proof of your ability to study academic subjects in English and can be used to support your application to university. TOEFL is also recognised by many international employers. The minimum course duration is 2 weeks and the maximum course duration is 12 weeks. For the best results, the language school recommends to choose either 6 or 12 weeks, depending on the level. The course consists of 20 lessons per week in groups with a maximum of 18 students. To read more about the TOEFL examination course please click here. The TOEFL course does not include the exam fee. If you would like to finish your course with a TOEFL test, please contact StudyTravel for advice about the best starting date for you. It it necessary to book an extra night of accommodation due to the exam date. Price on request. The one-to-one course is designed for those who want to optimise their study time. The aim of the one-to-one course programme is to offer a fully personalised method of teaching designed to meet the specific student's needs and desires. As the classes are private, the student will be able to choose the schedule and content. 20 hours per week. Take part in the daily life and share the experiences of a host family: a great opportunity to immerse yourself in the local life of Toronto and practise your English in a friendly and informal atmosphere. Students can stay only in a single room with half board. By paying a small supplement, you can choose to stay with a host family with internet access. You need to bring your own laptop.The maximum distance to the school is 60 minutes by public transport. With an executive host family, students can stay in a single room with half board with a private bathroom. This is a brand new, well-organized residence with incredible views of Downtown Vancouver. A number of apartments also offer partial views of the sea and the mountains. Each apartment consists of 2-3 single bedrooms and 2 twin bedrooms, 1 open-plan kitchen, 1 spacious living room, and two full shared bathrooms. Each bedroom is equipped with a bed, desk, chair, and allocated closet space per student. The residence is situated one block away from Davie Street, one of the most exciting neighbourhoods in Vancouver with fantastic nightlife, restaurants, cafes, and Sunset Beach just a short walk away. There are supermarkets and excellent transport links nearby. Robson Street, the city’s most popular shopping hotspot, is also a few blocks away from the residence. You'll have access to Wi-Fi, a fitness centre, and there is Cable TV in each bedroom. Laundry facilities are available, and bed linen will be provided by the residence. Walking distance to the school is 15 minutes.